“I left the office and went over to the bookstore to do as the Brethren had asked. I wasn’t opposed to doing it—I was just a little nervous, inasmuch as I was young, inexperienced, and not quite ready to take on the manager of Deseret Book. When Brother Perry told me what the royalties would be, I said that it was only half enough. I firmly suggested that if he would double it, the bookstore could have permission to publish Brother Cowley’s book, otherwise someone else would. He told me that this kind of arrangement had never been done before and he would have to check with the chairman of the board. “The next morning Brother Perry called and said that he had met with the chairman and they had agreed to double the royalty, all of which would be given to Sister Cowley. This agreement took place in December. The book was compiled, printed, and in the bookstores by April conference. That in itself was almost a miracle. Sister Marba Josephson did the bulk of the work, but I had the final say on what should go into the book and whether or not we would make any changes. Not many changes had to be made in the talks as he had given them. 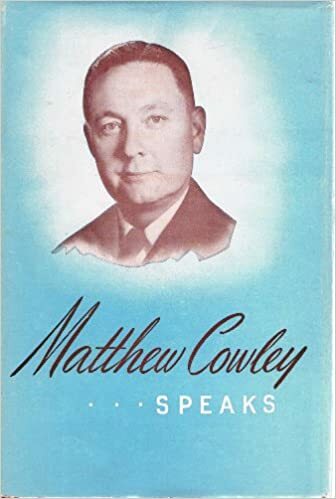 “His book, Matthew Cowley Speaks was a top seller. In fact, it became the best seller of any book of its kind in the history of the Church. Sister Cowley received royalties for the next twenty-five years, making it possible for her to live reasonably well for the rest of her life” (Glen L. Rudd, Treasured Experiences of Glen L. Rudd, 112-14). It seems that in succeeding editions, some slight silent editing of at least one talk in the book took place, evidently done by the publisher (for instance, some wording of a talk on pages 294-297). It may never be known why, but someone seems to have felt it necessary. In LDS book-collecting circles it is known that some of this silent editing occasionally occurs without comment. Could you cite the changes made, Dennis? @ BS a couple of the talks in the book were edited/shortened to remove references to Cowley's father Matthias Cowley who had been removed from the 12 in 1906 over his continued support of polygamy. The talk that was the most effected was called "Put Your Hand into the Hand of God." In the full version of the talk he describes how his father never lost his faith after being disciplined by the Church. The edited version cuts the story out. For those interested in learning more about Elder Matthias Cowley, from his son's point of view, Elder Rudd compiled a book called "Tender Mercies" which he has given out to many many friends and associates, and in which he records the stories about Matthias that Matthew told him when a young man. Some of the material talks about the plural marriage difficulities, but much of it talks about other interesting items as well. It also talks a lot about Matthew. This is one of the finest and most faith-promoting booklets I have ever read. It is the kind of thing that one wishes were available to the entire church in these times of doubt being a fad.